With less than a week until the Leap Motion Controller ships worldwide, we’re beginning the final push to ensure that everyone who receives a device has a truly wonderful experience. Your ongoing forum discussions and beta program feedback remain vital as we continue to make our dream a reality. This week, we also have great posts from Developer Labs on physics sandboxes and latency, plus some insight into how you can use Leap.js to build web experiences. We also have lively discussions about OS interaction and the conference market, plus videos showing how developers interfaced the Leap Motion Controller with Arduino and a humanoid robot. On Monday, the Leap Motion Controller will begin arriving at the doorsteps of pre-order customers around the world. Soon, everyone will be able to access a new dimension of interaction. They'll discover new possibilities in the Airspace Store™ – where they can explore, purchase, and download your apps. Since we launched the Developer Program in October, our developer community has grown by leaps and bounds. We’ve been continually amazed at the incredible apps created by our developers, and we’re excited to think that they’ll soon be available for the whole world to enjoy. With hundreds of thousands of new Leap Motion Controller owners waiting to access the Airspace Store, now is the time for everyone to redouble their efforts – whether you're just getting started, or on the cusp of getting your app approved for Airspace. We hope you're excited too – your hard work will soon be recognized. In six days, your apps will reach a massive audience, and you'll be able to get feedback from our global pre-order community. We also greatly appreciate the insightful conversations that happen every day on the forums and beta program site. Your feedback over the past nine months has been invaluable as we’ve worked to bring the Leap Motion Controller to the world. Thank you so much for your support and enthusiasm. Over the coming week, we’ll be keeping everyone updated with our launch progress on the Leap Motion blog. If you haven't placed a pre-order yet, you still have the chance to be in the second wave of shipping next week – place your order as soon as possible. Leap Physics Sandbox. Pohung Chen talks about his work creating 3D interactions with Unity, including a simple cube, cascading dominos, seesaw, bowling alley, billiards, and golf. Understanding Latency. In this two-part post, Raffi Bedikian dives deep to explain how our engineers combat latency – from the moment that the Leap Motion Controller’s infrared sensors capture a frame, to software and graphics constraints that cost milliseconds of response time. Also, eponymous created new Python bindings that don’t use SWIG. While they’re still a work in progress, you can check them out on GitHub. We've assembled a full library of code samples in a variety of languages and frameworks. Check it out in Links & Libraries. We love great debates over important issues at Leap Motion. With the latest phase of the beta in full swing, we’ve seen a lively discussion over OS interaction with the Leap Motion Controller. Check it out and weigh in with your thoughts. 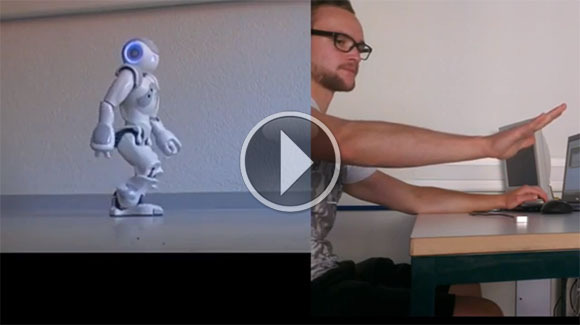 Niels Jacot created a control interface for Nao, a two-foot-tall robot with articulated arms, legs, and head. His app allows the user to directly control different parts of the robot's body, as well as direct it to walk. wilsonk sparked a discussion on possible applications for the Leap Motion Controller in professional and academic conferences. Beyond straightforward podium presentation control, he also suggests screen interactions and 3D interactive kiosks. 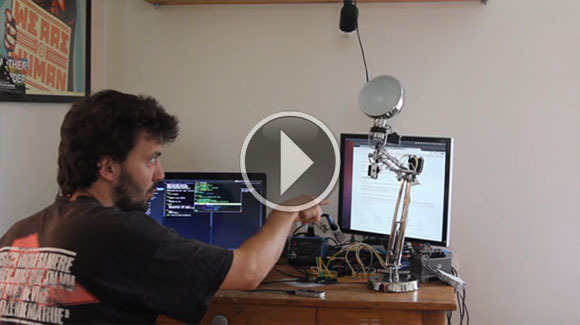 Using Node.js, xseignard interfaced the Leap Motion Controller and Arduino to bring a desktop lamp to life. He posted a brief guide on his website.